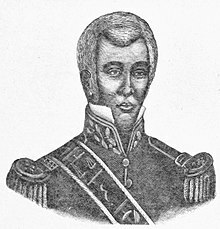 Jean-Louis Michel Pierrot (1761 – February 18, 1857) was a career officer general in the Haitian Army who also served as President of Haiti from April 16, 1845 to March 1, 1846. During the Haitian Revolution Pierrot led a black battalion at the Battle of Vertieres in 1803. During the period of the Haitian Kingdom, Henri Christophe (Henry I) promoted Pierrot to the rank of Lieutenant General in the Army and granted him the hereditary title of Prince. Pierrot was elected president of Haiti by the Council of State on April 16, 1845, the day after the death of Philippe Guerrier. As President of Haiti, he was intended to be a figurehead for the mulatto ruling class. Pierrot's most pressing duty as the new president was to check the incursions of the Dominicans, who were harassing the Haitian troops along the borders. Dominican boats were also making depredations on Haiti's coasts. President Pierrot decided to open a campaign against the Dominicans, whom he considered merely as insurgents. Haitians, however, were not inclined to go to war with their neighbors, and were unwilling to support the President's views. Furthermore, Pierrot had displeased the army by conferring military rank on the leaders of the peasants of the Sud department and on many of their followers. In addition, the inhabitants of the towns of this department felt uneasy regarding the tendencies of Pierrot, who had appointed Jean-Jacques Acaau, the former terrorist of Cayes, as Commandant of the Anse-à-Veau Arrondissement. Fearing a peasant revolt, the townsmen decided to divest Pierrot of his office. In consequence, on March 1, 1846, General Jean-Baptiste Riché was proclaimed President of the Republic at Port-au-Prince. On that same day, Pierrot resigned and retired to his plantation called Camp-Louise, where he led a quiet and peaceful life. Pierrot died on February 18, 1857. Pierrot's daughter, Marie Louise Amélia Célestine (Princess Pierrot), in 1845 married Lieutenant-General Pierre Nord Alexis, a provincial governor under Emperor Faustin I, who later became Haitian Minister for War from 1867 to 1869 and president of Haiti from 1902 to 1908. ^ a b c d e f g h i j k l Léger, Jacques Nicolas (1907). Haiti: Her History and Her Detractors. The Neale Publishing Company. pp. 197–98. ^ "Louis Michel Pierrot - TLP". Retrieved 9 March 2017. ^ Forsdick, Charles; Høgsbjerg, Christian (20 October 2016). Toussaint Louverture: A Black Jacobin in the Age of Revolutions. Pluto Press. pp. 133–143. ISBN 9780745335148.